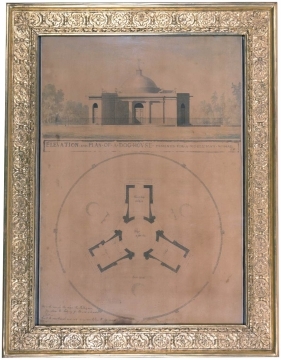 ELEVATION AND PLAN OF A DOG HOUSE DESIGNED FOR A NOBLEMAN ROMAE 1778: the plan is triangular having 3 long concave sides and 3 short, straight sides enclosing a rotunda and all within a railed circular exercise yard; between each of 3 wings is a circular drinking basin. The elevation has a Pantheon-type dome and flanking each of the 3 entrances to the rotunda is a pair of attached Greek Doric columns. Six sculpted hounds guard the roof and another decorates the weathervane.